Graphene technology in combination with an open string pattern makes this frame the first choice for players looking for more spin and added pop. 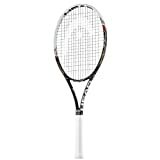 Features Head's new Graphene technology combining unparalleled lightness and a durability 200 times stronger than steel. Head Size: 100" sq. Weight 10.6oz (unstrung). Length: 27". String Pattern: 16/19. Balance: Head Light.